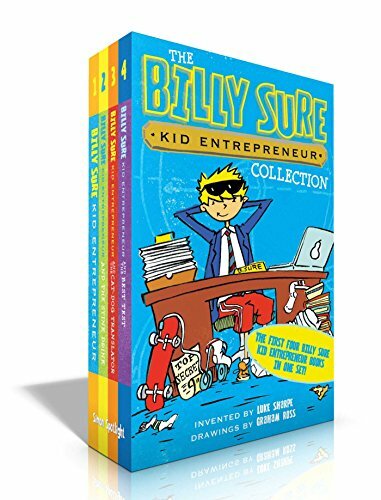 Join Billy Sure and his best friend, Manny Reyes, on inventing adventures filled with hilarity in the first four books in the Billy Sure Kid Entrepreneur series, now available in one zany boxed set! It sure is good to be Billy Sure these days. Along with his best friend and business partner, Manny Reyes, Billy runs Sure Things, Inc., and their first product, the All Ball (a ball that turns into different sports balls with the push of a button), is flying off the shelves. But while being a superstar inventor is super fun, it isn’t always super easy. Every day Billy must navigate school, homework, and his dad’s terrible cooking (stuffed sardines, anyone? ), all while coming up with bestselling inventions. Can this kid entrepreneur handle it all? For sure!